Ultra Final Touch Spray 425g | West4us.cz - Nejen westernová móda, dovoz z USA, skvělé ceny. Finální lesk na srst koně. Sprej pro špičkový "milionový" lesk. Extra jemné složení zanechá srst lesklou a citronelová vůně odpudí hmyz. Ideální pro použití na závodech a výstavách. Shake well before using. 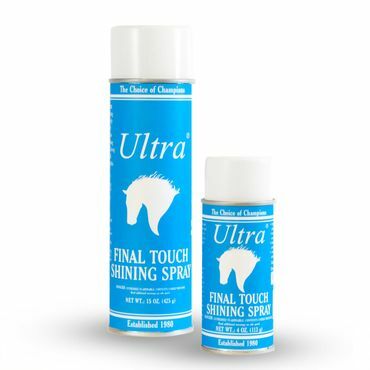 Holding can 10”-12” from horse, spray evenly over coat, mane and tail. In the direction of the hair, go over the coat with a soft towel or finishing brush to bring up a luxurious, long lasting shine. Repeat as needed. Do not spray near eyes or nostrils. KEEP OUT OF THE REACH OF CHILDREN. Use in a well-ventilated area. Avoid excessive inhalation of mist or vapor. WARNING: Intentional misuse by deliberately inhaling contents can be harmful or fatal. If swallowed, do not induce vomiting. Call physician immediately. In case of contact with eyes, flush thoroughly with water. DANGER: FLAMMABLE! DO NOT USE NEAR FIRE OR OPEN FLAME. CONTENTS UNDER PRESSURE. HARMFUL OR FATAL IF SWALLOWED. Do not puncture or incinerate. Do not expose to prolonged heat or sunlight. Do not store at temperatures over 120°F. Contains petroleum distallates and liquefied petroleum gas. May cause eye, skin or respiratory tract irritation. Avoid breathing of vapor or spray mist, eye contact or prolonged contact with skin.